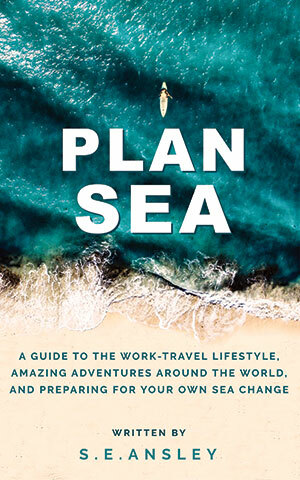 A guide to the work-travel life, amazing adventures around the world, and preparing for your own sea change. Plan Sea prepares for the unexpected, with back up plans to ensure safe and seamless travels and survival. Despite initially setting out on a "short" 3 month trip, Sea has since given up his Melbourne life altogether, now traveling indefinitely. The past 18 months' adventures have taken him through Europe, an unexpected spiritual journey through India, the magical utopia of Auroville, three Burning Man events, South Korea and South East Asia, from camping at beaches, national parks and a Danish quarry, to penthouses in Amsterdam and the Czech Republic, underground clubs in Berlin, mountain lodges in Poland, and even sleeping a night on the streets of Seoul. 22 countries in all so far. All on a budget of around $200 per week. Sea shares his core travel tips, demonstrating their impact along the way. The book covers trip planning, secrets to finding the best deals on transport and lodging, running multiple projects on the road, emergency money and cryptocurrency, long distance relationships (and break ups), and how travel makes a lasting impact on one's own place in the world. Ready for your own sea change? It starts with a dream, and making the first plans for your one way ticket to adventure. S.E. Ansley (Sea) was born in London to a Canadian mother and New Zealander father, and has lived all over the world. In 2014, Sea's life-changing world trip began with an epic three month voyage through South America, and his first Burning Man. A web developer freelancer and consultant since 2000, Sea is the founder and CEO of Mother.Domains, and lead writer and editor of DigitalNomad.Blog. His side projects include writing, making music, art and film, coaching, festivals and Burns, public speaking, researching and developing future technology, and living a flexible, adventurous lifestyle, running projects on the road for 5+ years. Plan Sea is his second book, following a satirical novel about a utopian city of dogs published as an 18-year old. He is currently working on the sequel, in cinematic and orchestral form, The Dogs Live On, and rumours are swirling of a coming music album. Sea's mission is to help elevate consciousness in society, and work towards a more peaceful, fairer world, for us all. Plan Sea is open for pre-orders on May 31, 2019, aimed for launch on June 28, 2019, available internationally in hardcover, paperback and deluxe eBook editions. A book tour is planned in Europe from July 2019, with dates in India, Africa and Asia-Pacific over the year ahead. Stay updated on news, exciting travel adventures during the book's final months of real life events, and preferred access to pre-order copies ahead of the book's launch. Just enter your email address, and we'll keep you posted. No spam - guaranteed. Thanks for your support! Questions? Ideas? Speaking or influencer opportunities?